Farming and agricultural business is the oldest business opportunities in India but still, have demand. 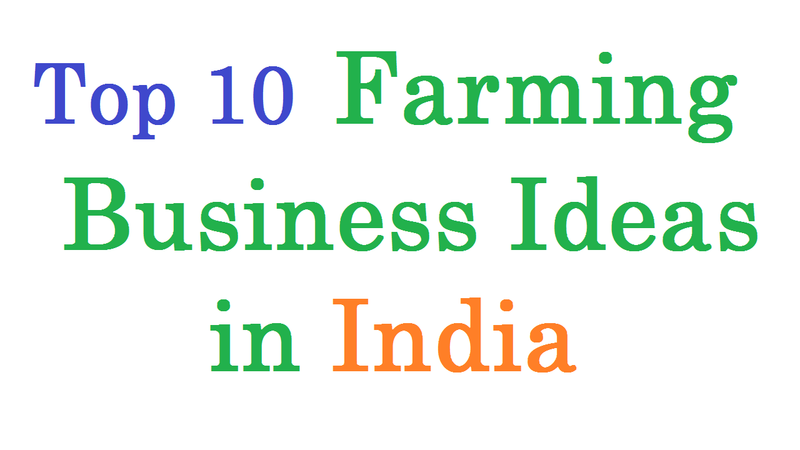 Today in the article I will share with you top 10 Farming Business Ideas India Based. Actually, farm refers to a system where the cultivation and preservation of plants and animals are done in a conspicuous way for commercial purposes. In this process, livestock and various commercial plants and animals are produced and marketed. Production and marketing work in the farm process is completed all over the world. In the modern world, farming is originated independently. In different countries, different animals and plant farms are being developed by a different process. For example, in the United States and Canada barley and maize are cultivated by the farming process. Besides, cattle and pigs are also observed. Due to the agro-based social system, different types of farms are being developed in India such as poultry farming, dairy farming, duck farming, fish farming, quails farming etc. In India, farming business is a potential business venture. In poultry farms generally observed broilers, turkey and other chickens for meat. If you are committed to hard work, talent and integrity towards work, then this business can be started with small capital. Anyone can start this business with a small investment. If you want to start a poultry farm, you should need a poultry house and some necessary equipment such as feeders, drinkers, cages, lighting systems etc. Poultry chickens have a huge market in India like all the world. In layer chicken farms generally observed chickens for commercial egg production. There is a huge demand for eggs in the local Indian market. Layer chicken is laying eggs after the age of 18 or 19 weeks. Layer chicken production usually lasted from 72 to 78 weeks. To start a layer chicken farm should be collected a good productive layer chick from well- known hatcheries. Layer chicken house should always be clean and sterile. It is a profitable farming business idea. Fish is the main source of animal protein. Fish industries are contributing to employment, foreign currency earning and nutrition. Fish are taken as food throughout the world. In a planned way in specific ponds fish can be cultivated by investing a small capital. Like many countries of the world, fish are also cultivated in India. Generally Roe, Katla, Silver carp, Mirror carp, Kalibous, Rajput etc. are cultivated in India. Because of the huge demand for fish in the market, any entrepreneur can make himself self-sufficient by starting a fish farm. It is a common business idea in a farming business sector. Duck Farming is a popular business Idea in the farming business venture. Duck is observed in different countries of the world. Due to India’s climate is suitable for ducks, various species of ducks are observed on the commercial basis in here. Duck can be observed in a few ways. To starting a duck farming you have to need enough space. Generally, each duck requires 10 feet space. Due to easy to raise the ducks, many young entrepreneurs are now becoming interested in starting this business. The Dairy farming can be an effective business venture to give some gifts to society by doing some constructive work as well as self-employment. The number of dairy farms in India is increasing day by day. This business market is also expanding day by day. Due to the supply of milk through this business, as well as dung and organic fertilizers are available as meat and fuel. Proper planning and initial preparation are needed to start a dairy farming. Experience is also needed for success in this business. There is no substitute for nutritious food to live healthily and vigorously. And to get the nutrients to eat plenty of vegetables. Generally, people’s food-friendly plants, plant organs, and plant fruits are called vegetables. Nutritional, economic and food security of the vegetables are enough important. Currently, more than 100 vegetables are grown in India like as cabbage, Cauliflower, Red Spinach, Moth, Carrots etc. you can start a vegetable farm with a small investment. Many entrepreneurs are interested in starting this business because of there is no extra hassles. It is a profitable business idea. Mushroom is a type of fungus-like as a toadstool. Mushroom contains plenty of minerals, proteins, and vitamins. So it is very nutritious as food. It has a huge demand at various hotels and restaurants in India. To cultivate mushrooms does not require arable land. Generally, three varieties of mushrooms are produced in India by scientific means. These are straw mushrooms, yar mushrooms, westers mushroom etc. It is a home based business idea. This business can be started as a part-time business. From a long time ago, snails have been cultivated in different countries of South Asia including India, Bangladesh. Snails are used mainly for making fish food. It is a risk-free business idea. Currently, educated young people of India are becoming interested to start this business. In this business, it is more profitable to invest less money. Any entrepreneur can start cultivating snail easily in the empty pond beside the house. This business is the most popular especially in the rural areas. Goat is an herbivorous mammal pet. Goat milk is very nutritious. One of the main sources of income of the poor people is keeping goats. It is the most important livestock of West Bengal. Goat farming is a very profitable business idea of the farming business. You can start a goat farm with a small investment easily. The risk of this business is very low because Goat diseases are less than other cattle. Any unemployed entrepreneur can create self-employment opportunities by starting a goat farming. From the beginning of creation, there is unlike of goodness and weakness in people towards flowers. A flower is the symbol of purity and love. In many countries of the world, flowers are cultivated commercially as a cash crop. At present, a flower has turned into an industry. Flowers such as rose, marigold, rhizoid, gladiolas, chrysanthemum etc. are generally cultivated in India. It is a seasonal business idea. The demand of this is increasing day by day in India. Any creative entrepreneurs can start this business easily with a little capital.